The labour federation says the national shutdown has intentionally been planned ahead of the budget speech, so their concerns could be addressed. NATIONAL NEWS - The Congress of South African Trade Unions (Cosatu) plans to bring economic activities in eight provinces to a complete halt on Wednesday, not only to highlight the plight of workers but also for the finance minister to take note of in his budget speech. The labour federation said the national shutdown was intentionally planned ahead of the budget speech so that minister Tito Mboweni could respond to the labour sector concerns on job losses, which the federation says should guide Mboweni’s distribution of resources. 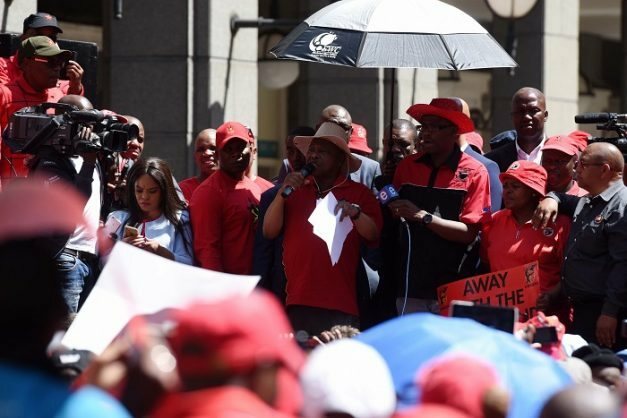 Cosatu spokesperson Sizwe Pamla said they were expecting thousands of workers to take part in the mass action, saying they would participate by simply staying at home and not going to work, while others would join picketing in major cities in eight provinces. He said the point of the strike was to bring everything to a halt and cause as much inconvenience as possible, affecting both the public and private sector. “Our hope is that our action will effect change. “We hope to have a budget that talks to what we are raising as concerns. We are hoping for a speech that talks on the distribution of resources to stimulate job creation,” Pamla said. He said top on their priority list of demands was a moratorium on retrenchments in the mining sector, saying the sector should come on board and discuss ways to assist struggling businesses. Pamla said some retrenchments were as a result of the crisis of profit, saying some big corporates were given tax incentives to stay afloat and create employment but these savings did not go where they were intended. He said the companies were treating South Africa as a casino, where they simply come and cash the chips of corporate tax rebates and other corporate incentives. “Big companies are mechanising but if we give them rebates to keep the labour force, they use the surplus out of the country,” he said. The federation said the real unemployment rate was 35%, with almost 10 million people struggling to get jobs and over 17 million people on social welfare. Pamla said the employment crisis in the country was such that both skilled and unskilled people stood to lose jobs, with job losses predicted in the mining sector, at Eskom and the SABC. Pamla lamented that state-owned entities were run into the ground by top executives, but ordinary workers on the ground got the chop. “These workers are first the victims of corruption,” he said. The federation said they have planned marches to government buildings and headquarters of major corporations.